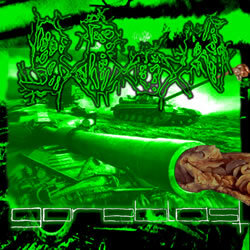 GOREBLAST was recorded from august 5th – october 16th 2005 at “Die Lobby” of the Lobbyunion, Alberestat im Friesenfeld, Goremany. All Musick composted, all lyrics written and all artworks done by The Almighty Mr. Goreblastexcept “Esto Es Real” by Tu Carne. Musick decomposed and deranged by SxRxOxM. Band photos taken by Katja Sieber.